Carolina UltraDry Work Socks takes the sweat out. The specially-engineered fibers used in UltraDry fabrics transport perspiration away from the body to the surface of the sock where it can evaporate quickly. UltraDry provides great breathability, even when wet. The breathability further enhances the thermoregulatory effect; so you stay dry and comfortable. High-performance Carolina Work Socks protect feet against cold or excessive heat and assist the foot&apos;s own temperature regulating function. Under varying climatic conditions, socks help balance the body&apos;s temperature and manage perspiration creating a pleasant "microclimate" next to the skin. Since human core temperature of the head and torso must remain at approximately 98.6°F (37°C), it is essential that heat be removed at the same rate it is produced. With increased physical exertion, more heat is generated throughout the body which causes people to sweat. The prerequisite for cooling is evaporation. Therefore, clothing (including socks) must have good moisture transfer capacity to ensure the microclimate next to the skin remains dry and comfortable. 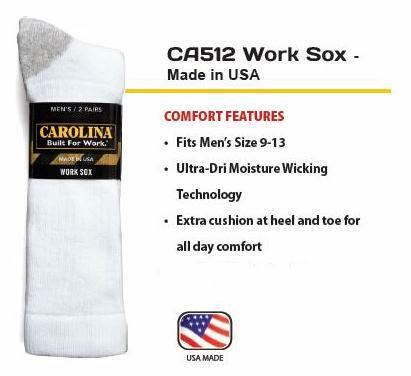 Carolina UltraDry Work Socks 6 Pair Pack.